One of the world's most popular luxury car maker from Sweden, Volvo Car Corporation has launched the most anticipated vehicle Volvo V40 cross country for the Indian customers. It has disclosed its plans about launching this vehicle last year and now after a long gap, it has finally introduced its top class crossover model in the market. The company has launched this vehicle in both petrol and diesel engine based option, out of which, Volvo V40 D3 is the diesel trim that has a powerful 2.0-litre turbo diesel engine. This premium class cross country vehicle will compete with the likes of Mercedes Benz B Class and others in the segment. Presently, this vehicle will be brought into the Indian market through CBU (Completely Built-in Unit) route, as Volvo doesn't have a completely knocked down (CKD) kit assembly plant in India. This premium cross country car will be imported from Belgium, which is minimizing the chances of the company to make its price competitive. This new vehicle launched by Volvo looks extremely good like no other vehicle of its class. This Volvo V40 crossover has got a huge interior cabin space with well crafted cabin design. It is further equipped with some top class features inside that makes it very comfortable and convenient in its own class. The company hasn't compromised on the safety and security features of this premium crossover and has incorporated some of the most innovative safety functions to it. There is no doubt that the Volvo V40 crossover is going to create waves across the luxury cars segment with its highly advanced and innovative features. The all new Volvo V40 D3 diesel trim looks extremely stylish with a cues of aggressiveness and sportiveness that makes as one of the best looking cars in the segment. Its front fascia is stylish and it is much similar to other Volvo cars with stylish head lamp cluster and perforated chrome radiator grille with company logo affixed on to it. Its front facade gets a unique look because of the sporty design body colored bumper integrated with perforated air dam, fog lamps and protective claddings. The side profile of this diesel trim has got a very sleek body design, stylish external rear view mirrors and more. The side profile look is further enhanced by the sporty design alloy wheels that are fitted to the wheel arches of this Volvo V40. The external rear view mirrors are offered in black color and it is further incorporated with side indicators. The rear end design of this premium crossover is extremely sporty and unique like no other vehicle. You can notice that the vehicle has got a rear spoiler along with small antenna, edgy design head lamp cluster with integrated side indicators and body colored bumper. Its bumper has been equipped with double layered bumper cladding with black and silver color. At the bottom you can notice that two chrome tipped exhausts have been given that adds more sportiveness to the rear end. The overall look of this top class vehicle is something that will captivate the customers instantly. This Volvo V40 D3 diesel trims interior design is very simple like most of the cars, but the rich quality material used in it makes it plush and elegant. The company has used premium leather upholstery that bring a rich look inside this car. The company has equipped with ergonomically designed seats that are fully covered with premium leather upholstery. The steering wheel along with the hand brake have also been covered with leather upholstery. There are few other noticeable features incorporated inside the interior which include multi function steering wheel, internal rear view mirror, passenger vanity mirror, glove compartment, driver arm rest, passenger arm rest, driver seat height adjustment, and lots of other features. The Swedish automaker Volvo has blessed this new Volvo V40 crossover with a high performance 2.0-litre turbo diesel engine with start/stop technology. This engine has been equipped with 5-cylinders and has the displacing capacity of about 1984cc that churns out 150bhp at 3500rpm and produces 350Nm of maximum torque output at 1500 to 2750rpm. This powerful diesel engine is further mated to a highly advanced 6-speed automatic transmission gearbox that transmits all the power through front wheels. This vehicle has a total fuel storage capacity of about 60 litres, which is impressive. This Volvo V40 D3 diesel trim is a powerful crossover of its class and it is equipped with superior class braking and handling mechanism. The front and rear wheels of this vehicle have been equipped with a high quality disc brakes, which are further assisted by anti-lock braking system along with hydraulic brake assist and ready alert brake. The company is offering a multi-link rear and McPherson spring strut front suspension system mounted on a rigid body. These front and rear suspensions interact to provide a crisp steering and stable braking. On the other side, it is equipped with a highly responsive power steering, which also facilitates the rear wheel in curves that adds more stability to the vehicle. Volvo is a popular luxury car manufacturer in the world, which has got top class safety features for all its cars globally. This newly launched Volvo V40 D3 diesel trim is a premium crossover that comes with tremendous safety and security features that makes it one of the most safest cars to drive in the segment. Its safety features include, adaptive cruise control, driver alert control, road sign information, blind spot information system, lane keeping aid, energy absorbing frontal structure, dual stage airbags for driver and passenger, collapsible steering column, power child safety lock, passenger airbag cutoff switch are just few to name. These security features are best in class and perhaps, they are incomparable to the safety functions of any other car in this world. The comfort and convenience features offered with this Volvo V40 D3 Diesel trim are something more than you can bargain for. The list of features include electronic climate control, cabin filter, interior air quality system , front cup holders, multifunction steering wheel, electrically adjustable external rear view mirrors, storage behind front center console, rear cabin storage socket, leather seating upholstery, electrically powered seats with remote memory, heated seats front and rear, coat hanger, illuminated lockable glove box and several others. Pros: Irresistibly good looking, mind blowing safety features, top class comfort features. Cons: Expensive price tag, interior cabin design is simple. 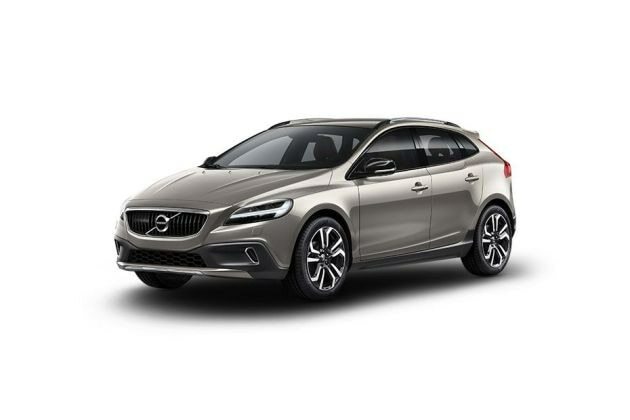 Volvo V40 Cross Country 2013-2016 is available in 6 different colours - Misty Blue, Raw Copper Metallic, Electric Silver Metallic, Passion Red, Black Sapphire Metallic, Biarritz Blue Metallic - Volvo.